Italian brand Cinelli can always be relied to come up with a clever name for a new product and their latest is no exception. WYSIWYG is a full carbon-fibre time trial frame with a “fully adjustable seat position system” which means it will be pitched as much at triathletes as Dr Hutch’s acolytes when released in the 2012 range. 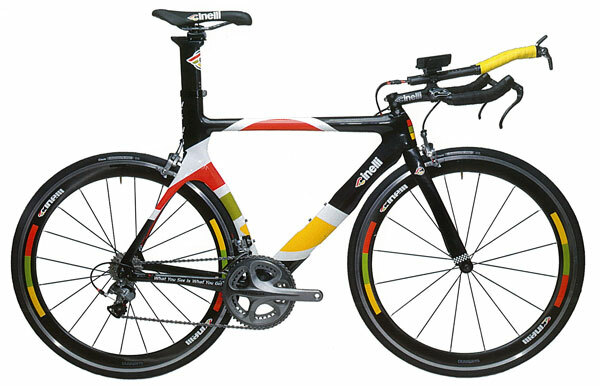 According to Mike Catlin at the UK distributor R J Chicken, “The paint job alone is stirring up some very Marmite-type reactions,” which is usually a good sign with triathletes and time-triallists. No pricing or other information so far but it won’t be even moderately cheap, we can safely say. Show some love for ‘The Bike Show’ free podcast from Resonance FM, the London arts station, and buy its fund-raising, limited-edition summer cycling jersey. A collaboration between web based kit-maker Milltag, designer Richard Mitchelson – a.k.a. RichMich – and the show’s writer and presenter Jack Thurston, the exclusive garment is claimed to be inspired by the orange of Molteni and Bic jerseys of old as well as bang-up-to-date Euskatel-Euskadi. 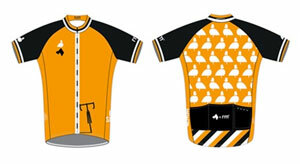 “It’s an indisputable fact: you’ll climb faster in orange,” according to Milltag’s website which goes on, “as you pull away from the pack, other riders will be left admiring the mildly hypnotic flight of London pigeons on the back of the jersey.” £70 with orders taken up to 3rd July with delivery in mid-August. KCNC also have a new lightweight slotted and hollow-pinned 10-speed chain to match. 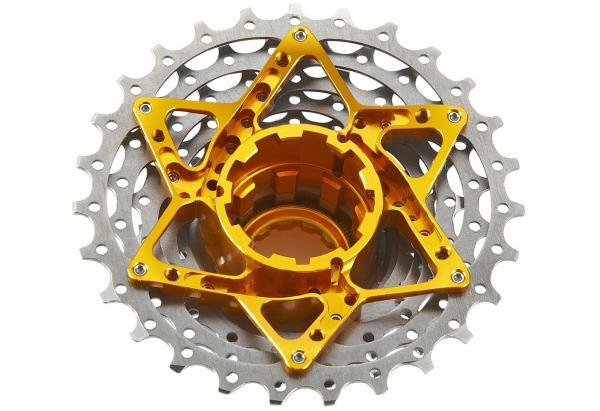 We’re just waiting for the weight but the price is £45.99 and the hard titanium-nitride coating also adds a shiny gold colour, which is never a bad thing in a chain. 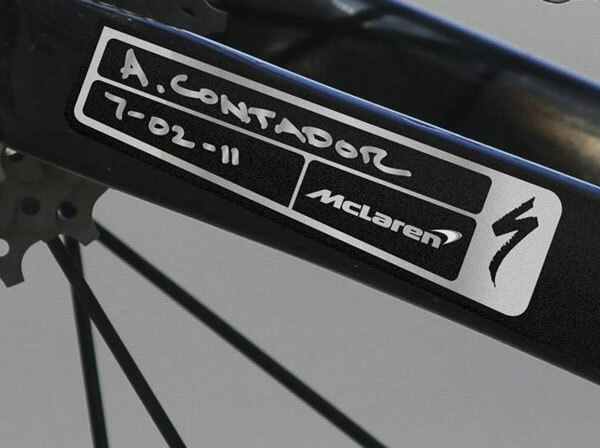 Guess what Contador is riding for the Tour? Specialized have sent a little tease ahead of their Team Saxo Tour de France team presentation next week. Apparently riders Porte, Vinokourev, Kreuziger, Van Garderen and Martin, as well as the controversial Spaniard, will all be riding not just the Specialized Venge but the super-duper McLaren-fettled version of the Venge. Yay. The Tour de France hasn’t even started and not only are 2012 bikes starting to be mentioned but next winter’s cyclo-cross bikes are cruelly due in the shops. Of course, at ‘popular’ prices beneath the government’s Cycle-To-Work-Scheme £1,000 threshold and with useful features like mudguard and rack bosses, the manufacturers’ idea of a ‘cross bike is one that can be ridden all-year-round to work and then used for some lane-bashing at the weekends. Yes, maybe even raced in the mud season. The customers must be agreeing because more and more makers are piling in; not least Fuji, whose own three-model 2012 ‘cross range is due to hit the Evans stores at the end of this month. 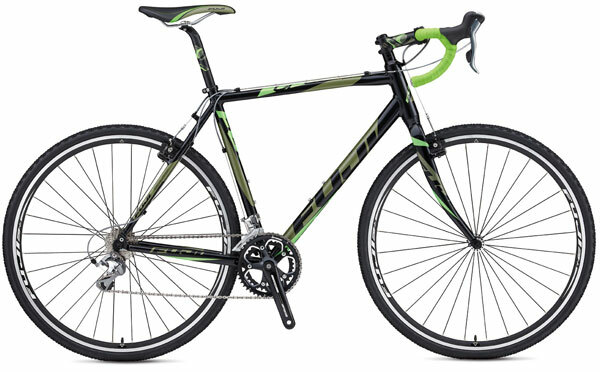 There are £1,800 Ultegra and Shimano 105-equipped versions of a striking alloy frame for £1,200 but the one we’ve highlighted, because it just seems to make so much sense for a wide range of riders, is this £899.99 version fitted with Shimano’s new 10-speed Tiagra. That means as you trash the drivetrain, you’ll be able to replace with a much wider choice of components from the more durable 105 and Ultegra racks; it’s all good. Is this the ultimate ‘anorak’ cycling video? Who cares? It’s brilliant and the music is superb. Mudguard and accessories maker SKS showed us this 12-minute film showing how to fit their Longboard mudguards properly and it seemed doubly hilarious bearing in mind every cyclist we know is complaining at having taken off their mudguards in readiness for the summer. Production is by Rivendell Bicycle Works in California. Check out that cool tourer. The core of Velobici’s clothing range is based on garments made of organic Merino wool knitted on high-tech machines in the area around its Leicester base. After a successful first year, the range is already expanding and this plain and simple Firenze Pullover is a good example of the new additions. The Firenze is completely seamless for comfort and styled with a dropped rear hem for gapless cycling. 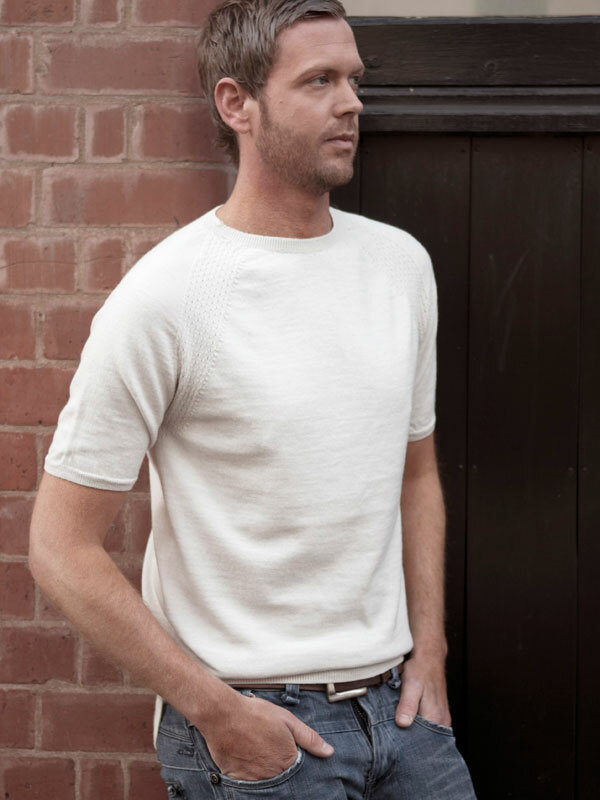 Velobici claim, “it’s soft to the touch, breathable, insulating and anti-bacterial and can be worn on its own or with shirt, tee shirt or base layer.” £95 in beige or indigo. Gu Energy Gel is already available in some wild flavours like Tri-Berry, Chocolate Outrage and Jet Blackberry but the new Espresso Love option adds adult taste and a cheerful dose of caffeine for those early-morning starts. According to the makers, Gu “delivers high-quality, easily-digested and long-lasting energy for athletes in every sport and at all levels. GU also includes electrolytes to ensure proper hydration, an antioxidant blend to stave off muscle tissue damage and an amino acid blend to delay muscle fatigue.” 24 x 32 gram easy-to-open gel packs in a box cost £20.